R. D. Gidney and W. P J. Millar. Professional Gentlemen: the Professions in Nineteenth-Century Ontario. Toronto: University of Toronto Press, 1994. Pp. 505. Noël Baillargeon. Le Séminaire de Québec de 1800 à 1850. Sainte-Foy: les Presses de l'Université Laval, 1994. Pp. 410. A. B. McKillop. Matters of Mind: The University of Ontario, 1791-1951. Toronto: University of Toronto Press, 1994. Pp. 716. Gordon Darroch and Lee Soltow. Property and Inequality in Victorian Ontario: Structural Patterns and Cultural Communities in the 1871 Census. Toronto: University of Toronto Press, 1994. Pp. xvi, 280. Katherine Pettipas. Severing the Ties that Bind: Government Repression of Indigenous Religious Ceremonies on the Prairies (Manitoba Studies in Native History, No. 7). Winnipeg: University of Manitoba Press, 1994. Pp. xiv, 304. Raymond Huel, ed. Western Oblate Studies 3/Etudes Oblates de l'Ouest 3. Edmonton: Western Canadian Publishers, 1994. Pp. 158. Donald Soucy and Harold Pearse. 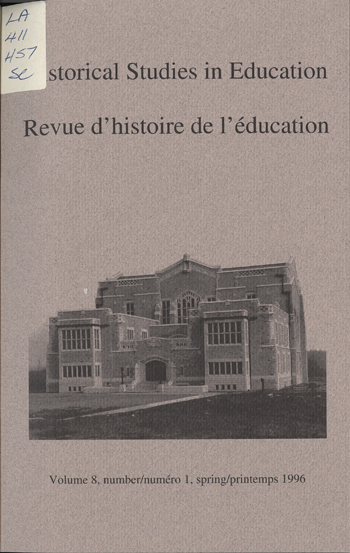 The First Hundred Years: A History of the Nova Scotia College of Art and Design. Fredericton/Halifax: University of New Brunswick Faculty of Education/Nova Scotia College of Art and Design, 1993. Pp. 182. Robert Thomas Dixon. Be a Teacher: A History of the Ontario English Catholic Teachers' Association, 1944-1994. Toronto: Ontario English Catholic Teachers' Association, 1994. Pp. 541. R. J. W. Selleck. James Kay-Shuttleworth: Journey of an Outsider. London: The Woburn Press, 1994. Pp. 494. Alain Choppin, dir. Manuels scolaires, Etats et sociétés, XIXe-XXe siècles. Paris: Institut National de Recherche Pédagogique/Service d'histoire de l'éducation, 1993. Pp. 228. Kathleen L. Lodwick. Educating the Women of Hainan: the Career of Margaret Moninger in China, 1915-1942. Lexington: University of Kentucky Press, 1995. Pp. xvi, 255. Robert F. Arnove. Education as Contested Terrain: Nicaragua, 1979-1993. Boulder, Col.: Westview Press, 1994. Pp. 234. Christophe Charle, dir. Les universités germaniques, XIXe-XXe siècles. Paris: Institut National de Recherche Pédagogique/Service d'histoire de l'éducation, 1994. Pp. 167. George L. Williams. Fascist Thought and Totalitarianism in Italy's Secondary Schools: Theory and Practice, 1922-1943 (Studies in Modern European History, vol. 10). New York: Peter Lang, 1994. Pp. xii, 267.